When the Healthy Living Centre team spoke with hundreds of local residents about the community, there was real concern about the volume of rubbish that littered the area. Some residents were concerned that if our local green spaces didn’t appear to be looked after, developers might be given permission to build. 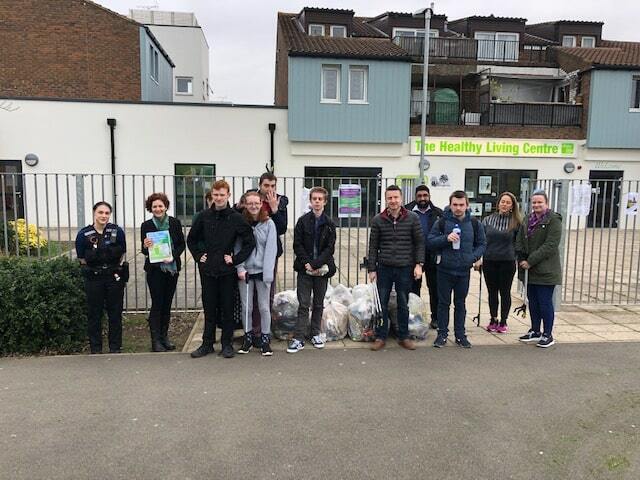 Having listened to these concerns, the Healthy Living Centre team arranged a community clean-up as part of The Great British Spring Clean. On Friday 22 March, we were joined by the local PCSO and an enthusiastic team of teachers and students from Pebblebrook School. Thank you to all of these wonderful #litterheroes! In 90 minutes, we filled 10 bags of rubbish from the green areas surrounding The Healthy Living Centre and Walton Court Shops. We hope that children, dog walkers and other members of the community will be able to enjoy these local spaces a little more, now that the majority of litter has been removed. Please, can you help us to keep our green spaces tidy by using the bins or taking your litter home? We want to take great pride in our community.